There are of course many other historical and contemporary writers and teachers who have directly or indirectly likened perception to a door or gateway, one waiting to be opened and generally affording new perspective, growth, or even liberation. In particular, they include Gautama Buddha and modern mindfulness advocates writing about or cognizant of eastern meditative practices. And they include various scientists and philosophers exploring the natural limits and opportunities of perception. As you will see, my own views about the doors of perception are a blend or synthesis of mindfulness and scientific viewpoints. To consider perception in a new, natural, powerful, and often freeing way – potentially altering both how we experience life and how we live it – let’s begin with a simple definition of perception. In scientific or objective terms, but also distilling or reductionistic ones, perception is the processing of sensory information by our nervous system. Things in the world have physical qualities or information – such as color, sound, or texture – which stimulate our senses when we attend to or interact with them and our environment overall. These sensory stimulations are then converted into electrical nerve impulses, which are received and interpreted by our brains. In these terms, each of our individual or subjective perceptions can be understood as the results of this processing. While this common textbook description of perception is concrete, compact, and useful, it is also narrow and superficial too, since it misses what is perhaps the most essential and important characteristic of perception. This is the vast, multifaceted, and enriching experiential landscape that is, or that can be, human perception. The definition also fails to reflectively point out that natural perception enables not just scientific analysis, but also deep and intrinsic appreciation of ourselves and the world, appraisals of life’s opportunities and nuances, and emotion and the pursuit of meaning in life. Without perception, we would have only a vegetative or crudely groping mode of life. Given this, perception can be understood as lying at the core of our nature and fundamental to our existence as highly-evolved animals. Indeed, without rich and maturing perceptions, and without our active and progressive use of these perceptions, we could not have a fully human life in any recognizable sense of this term, since we would be unable to activate and utilize our essential human capacities for discernment, reasoning, empathy, and choice. And as we will discuss, without the added step of achieving truly attentive perception, our lives can be greatly limited, less intelligent or aware, and less satisfying than they might be. How we perceive or interpret complex nerve stimulations from our senses, and thus from the rich natural world around us, is a vast topic. Essential aspects of this process include the natural structure of our brains, which has been long-evolved for adaptiveness or health, and thus has been carefully shaped for particular modes of perceiving. Perception is also a function of our culture and past experiences, and the often unconscious memories, habits, and expectations, or framing, that we bring to life, each moment of our lives. And perception is influenced by our level of attention or attentiveness, since we have the ability as intelligent animals to be self-aware – and to employ or leverage self-awareness to examine, train or deepen, and thus alter or enrich our perceptions. Importantly, let me add that perception also can be understood scientifically or objectively as one of four principal modes or categories of human or animal functioning. 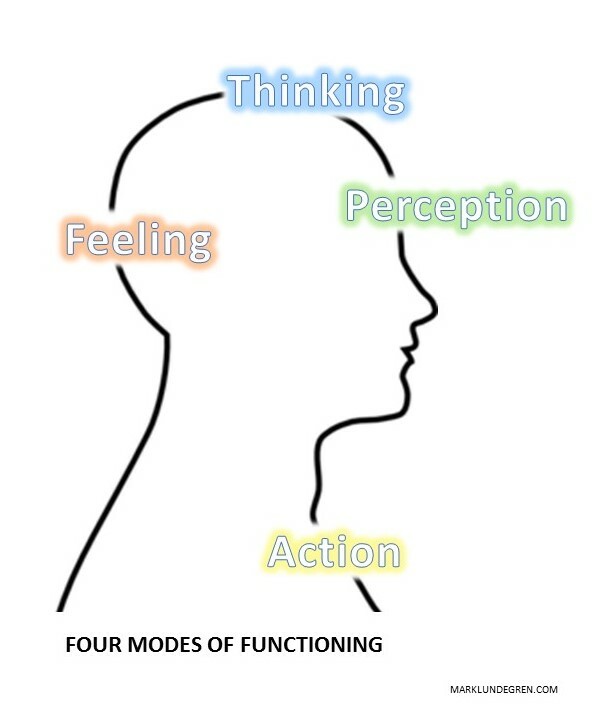 As summarized in my exhibit to the left, these four natural modes of functioning are: 1) Perception, 2) Thinking, 3) Feeling, and 4) Action. > Our Functional Biases – in practice, most of us are naturally, culturally, experientially, or otherwise drawn toward one or two modes of functioning in this four-part model of the self (see Personal Styles for a useful treatment of this idea). And while we may be personally biased toward perception, without intentional guidance and cultivation of this characteristic, achieving and leveraging the trait of attentive perception is exceptional in many or most cultures and settings. In practice, and perhaps simply owing to the natural or situational demands of daily life, most of us tend to be biased toward: 1) thinking, feeling, or action, 2) some combination of these three often dominating modes of functioning, or 3) perceiving that is strongly, unconsciously, or inattentively colored and constrained by these other modes of natural functioning. 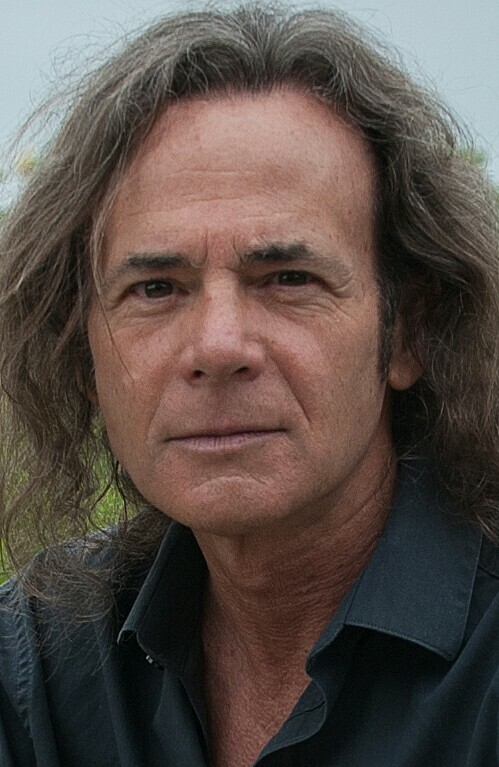 > Creating Time & Space – given these common biases or imbalances in our functioning, if we wish to explore the generally liberating doors of attentive perception, and the added insights and freedom that can come through a deeper and more subtle experience of life, this almost always involves altering our habitual modes or mix of functioning. We must find a way, in other words, to make time and space for attentive or intentional perception – as an end, practice, and principal mode of life in itself. And this change is nearly always achieved by at least periodically reducing our level or degree of thinking, feeling, and action, creating room for or re-prioritizing attentive perception and observation. As underscored by centuries of meditative or observational practices, and now by modern mindfulness research, this shift away from conventional or expedient thinking, feeling, and action toward the practiced and frequently more powerful state of heightened perception is usually accomplished through relaxing, calming, stilling, and ultimately observing our normal daily functioning – opening us to richer and more expansive perceptions, and thereby the opportunities of a more intimate experience of life and more informed or careful judgments and choices. Conversely, if we are busily or inattentively caught up in thinking, feeling, and/or action, we are unlikely to perceive as actively, deeply, richly, or adaptively as possible – or to live as attentively as possible. And we are thus also less likely to live as thoughtfully, receptively, and deliberately as possible as well, for reasons we will discuss next. 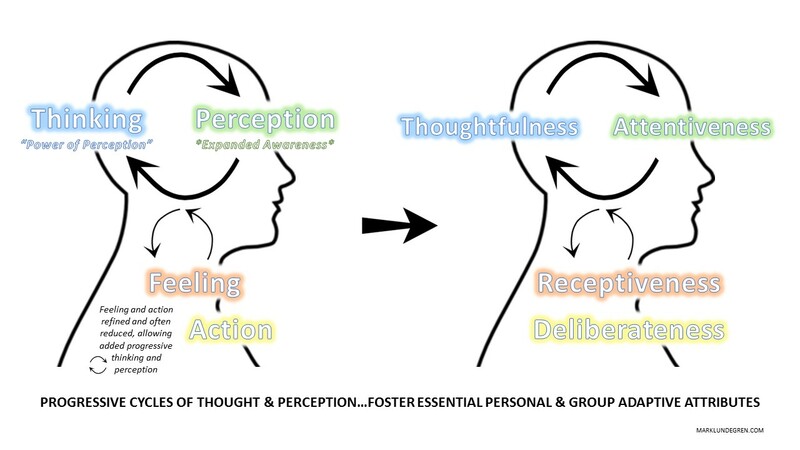 > Thought & Perception – my highlighting of the important qualities of receptiveness, deliberateness, and especially thoughtfulness is important to understanding the full practice, scope, and potential power of attentive or perceptive life. First, consider that this entire discussion about the nature and power of perception is primarily in the realm of thought and language, or via the mechanism of thinking, even as it naturally inspires feelings and requires perception and action. In the cognitive-behavioral approach, thought is seen as the primary driver of our behavior and our most important function for quality of life – distilling our feelings and perceptions and formulating and guiding our actions. Thought is also viewed as our primary mechanism or means for self-improvement and advancement – for working through and then to our needed goals – and there is considerable research to support this view. By contrast, in mindfulness practices and research, perception – and attentive perception in particular – is seen as the gateway to improved thinking and functioning more broadly, to greater happiness and life satisfaction, and even to personal liberation. Overall, we have good reason to think that both views are correct – that progressive thought can lead to improved functioning, including more attentive perception, and that attentive perception can progressively improve our thinking and other functioning quite broadly – and this is my view. For me, guiding thought and attentive perception allow us to reach and then pass through the doors of perception, and to enter the rich, even infinite world beyond them, waiting for us at each moment of life. Together, they permit us to more fully appreciate the remarkable features and events of the world, always around and influencing us but often seemingly apart from or ancillary to us, as we naturally and continually perceive, feel, think, and act our way through life. This fairly simple but often quite useful summary of the science of perception may be new to you or not. It also may or may not align with your current views about how we naturally function amid daily life. And its description of the two most critical elements of both routine and improved or progressive functioning – probing thought and attentive perception – may or may not seem immediately obvious or actionable to you. But in all cases, I would encourage you to consider that these ideas are anything but mundane or abstract, that you can and should explore progressive thought and perception for yourself, and that you might become significantly transformed from this effort. In the ultimate test of all models and ideas related to positive personal change – tangible improvement in our lives and choices – attentive perception and guiding thought prove enormously powerful and consequential. As I have suggested, they reliably form a progressive circle or cyclical process, and naturally inform and promote one another. Combined, they can expand and remake our sense of life and the world around us – changing and improving how we perceive, how we think, and how we feel and act. In this deliberate but natural process, informing thought and ideas can be understood as the keys that unlock and open the doors to deep, attentive, and transforming perceptions of the world and ourselves. Increased or altered perception, in turn, can be seen as doors or gateways that lead us to remade or revitalized thoughts, feelings, and actions in our lives. As described in my graphic above, this circular or compounding process can immediately increase the quality of our perceptions and thoughts, and of our feelings and actions too – and all naturally, without drugs or negative side-effects, simply by using the deeply evolved faculty and natural gift of perception available to us all. 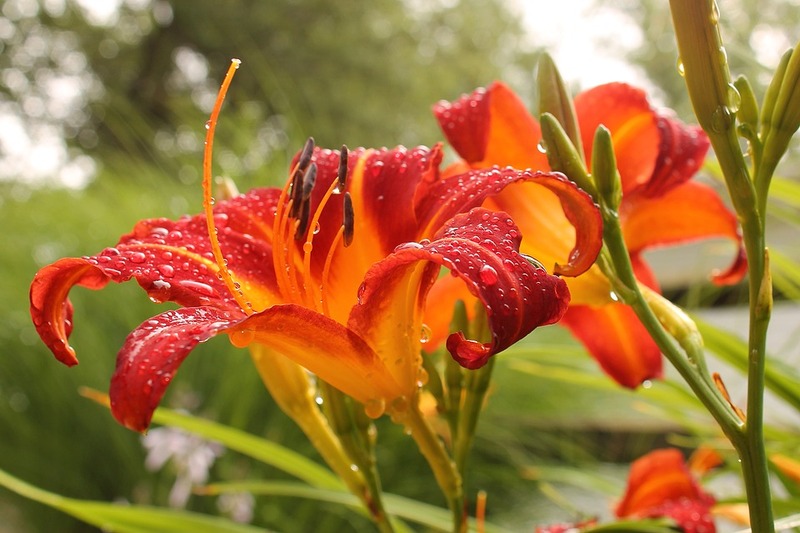 Opening the natural doors of attentive perception in this way is often palpably felt as a sense of awakening or re-awakening to life, and to the world’s natural or inherent richness, depth, and profoundness. As my flower photo above hints at, through new emphasis and exploration of perception, even simple objects in the field or background of everyday life immediately become vivid foreground entities in themselves – waiting to be examined, often informing us in unexpected new ways, surprising and delighting, and giving us new access to the magnificence that is both existence and ourselves. Crucially, in the move to re-prioritize perception, and through the sustained practice of attentive perception, we naturally reduce entrapment or immersion in needless, unwise, disquieting, or maladaptive feeling, thought, and action. The choice to observe frees us from rote functioning and further and circularly increases our capacity for choice. It reliably improves the quality, accuracy, or effectiveness of our thoughts and other functioning. And it reinforces the practice of ensuring adequate time and space for perception in our lives. This cultivation or freeing of the observing self, in turn, leads steadily us to escape from more limited notions of life, and to create new life in the often very different world that waits beyond the doors of perception. To begin the powerful, often initially strange but then relatively easy, and regularly transforming practice of opening and then passing through the doors of perception, we really need only begin. Perception is a ready and readily accessed natural human capacity. It is overlooked and underleveraged primarily because it is overlooked and underleveraged, rather than owing to any formidable barrier to its use. In practice, and as I have suggested, our principal obstacle to attentive perception generally lies in routine and less than optimal ways we use time and space, passively or thoughtlessly adhere to convention and habit, and inattentively or impulsively favor expedient feeling, thought, and/or action. As a start, pick an object, really any object at hand, and perceive or observe it closely. If possible, handle the object and carefully sense its feel, its weight, its scent, and the sound it makes against your fingers. At the same time, seek to be aware of or observe your thoughts and feelings as you perceive and act in this way, and be open to any insights or learnings that occur to you. Now, repeat this exploration of deliberate, careful, and multi-sense perception with other objects, and then in different settings. And continue exploring the world in this way until heightened perception becomes a regular practice in your life, and then a habit and new natural part of who you are and how you function in the world. As you become more practiced in the art of attentive perception, in life beyond the doors of perception, and in gaining insights and lessons from your time there, work to expand your practice of careful perception to all things – observing the objects and phenomena of the world, others around you, and then yourself and your own inward and outward functioning. What you will find in this sustained practice of conscious perception I will not attempt to describe, and thus potentially bias or inhibit. But I would encourage you to expect a world that is at once more personalized, more universal, far richer, and more complete than most of us ordinarily experience and realize. And this is especially true if we are normally caught up in unconscious feeling, thought, and action, or only peer hazily or timidly through the naturally wide, inviting, and extraordinary doors of perception. This entry was posted on February 5, 2017, 7:01 pm and is filed under Strategy Insights, Strategy Practices. You can follow any responses to this entry through RSS 2.0. You can leave a response, or trackback from your own site.